One year! Woohoo!!! Brian put up with me for an entire year!!! Yup. It’s our anniversary. One year ago today, amidst a monsoon, we entered into a covenant with God. We became man and wife. What a year it’s been, and –thanks to the blog– I can look back at every day of it. So can everyone else. This blog has been part of the journey. I just looked back and read my post from our wedding day. I cried. It was a beautiful day, in spite of the storm. It was a picture of the year to come– beauty, in spite of the rain. Marriage is hard. We idealize it as single women, thinking that once we’re married, everything will be perfect. But instead of perfection, it shows you everything ugly and twisted about yourself. I’ve realized my need for God over and over and over this year. I shoot up prayers constantly: “help me love him better,” “help me forgive,” “help me get over my selfishness,” “help me to serve him even though I don’t like him right now,” “help me to love him like you love me.” I truly do not know how people stayed married without Jesus in the middle of their marriage. And while I am seeing all of the ugly stuff inside of me bubble up to the surface, Brian is in front of me telling me how beautiful I am, how loving I am, how strong I am. I have never been more confident or comfortable in my own skin. He builds me up every day with his words and actions. For the first few weeks of marriage, the first thing I did in the morning was check to make sure he was still there– that he hadn’t left me. But a year later, I know Brian will be there, every morning, snoring away. He sees the ugly, but tells me I’m beautiful. He sees the tears and fear, and tells me I am strong. He sees me struggle, and he leads me in prayer. I look back at year one and see so much beauty and joy that I can face the future confidently. No, I don’t know what lies ahead, but I do know that Brian and I have learned (and are learning) to communicate well, to serve one another, and to keep God at the center of our marriage. One year down, many more to go. Several struggles overcome, countless more on their way. But even as I type this, I have an image in my head of me grabbing Brian’s hand and running forward. And that’s what I think marriage is– you say yes to God and to one man, and then you run forward… together. I’m so glad to have Brian as my partner in this life– to love him and serve him and put up with him and point him back to God. And that’s what he does for me. So today we smile and remember for this day one year ago. And then we turn and move forward towards more laughter and love, more trials and struggles, and to more days like today… to smile and remember. 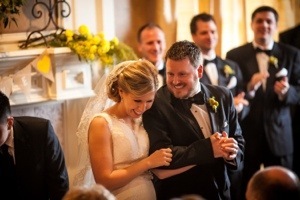 This entry was posted in Marriage, Our First Year by Lindsey. Bookmark the permalink. Congratulations! I’ve enjoyed watching you two grow together this year!